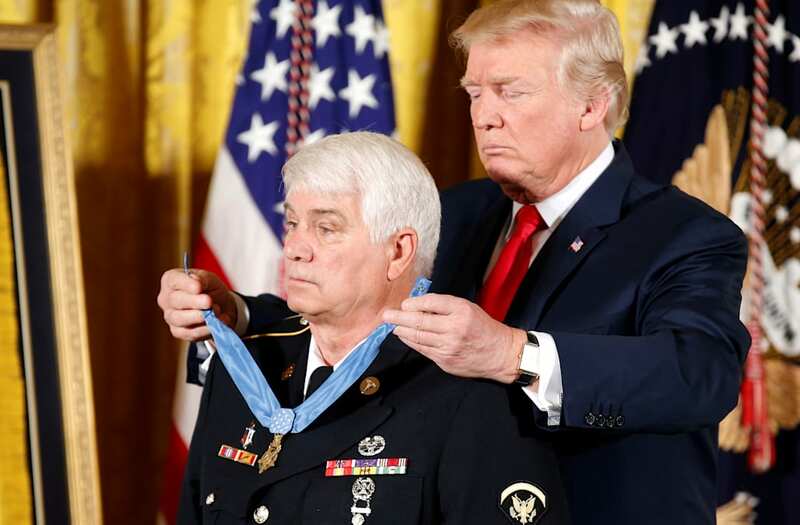 President Donald Trump on Monday presented the nation's highest award for battlefield valor to Spc-5 Jim McCloughan for the former Army medic's actions during the Vietnam War. "Jim did what his father had taught him. He gave it his all, and he just kept giving," Trump said. "He would not yield. He would not rest. He would not stop. And he would not flinch in the face of death and definite danger." "It quickly became clear that they were surrounded by enemy troops," Trump said. With "complete disregard for his own life," he ran 100 meters through an open field to rescue a wounded soldier, according to the award citation. McCloughan was wounded twice during the two-day mission, in which he repeatedly braved enemy fire to rescue his comrades. Later in the battle, he refused medical evacuation and, when supplies ran low, volunteered to guide helicopters into the area at night by using a blinking strobe light, even as "bullets landed all around him."